CREADIS3-Smart Creative Districts programaren partaideek Zorrotzaurreko Konsoni Lantegia (Eusko Jaurlaritzaren Kultura Sailaren industria-ondare higigarrien biltegia) bisitatu zuten (argazkia: IOHLEE). 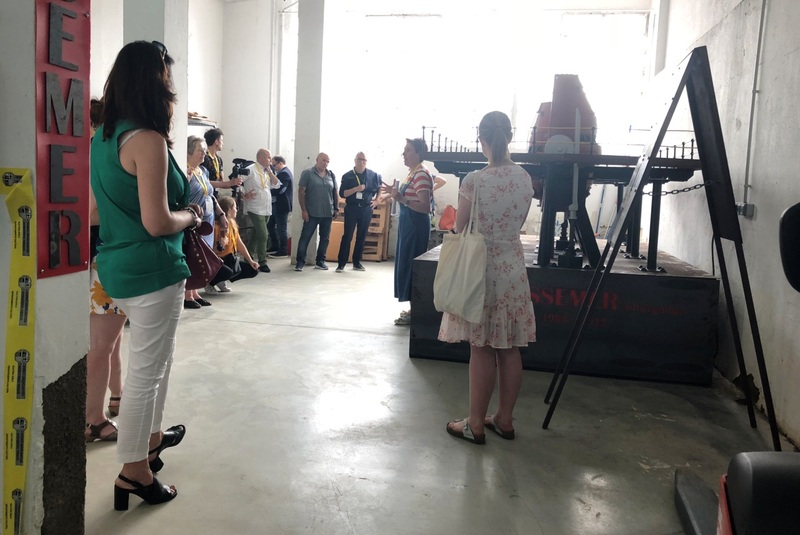 Hori dela eta, uztailaren 3an Euskadirako study visit-ean hartu genuen parte, eta proiektuaren bazkideak (Erdialdeko Finlandia, Emilia Romagna, Mendebaldeko Grezia, Valonia eta Eslovakiako ordezkariak) lagundu genituen Konsoni Lantegia (Eusko Jaurlaritzaren Kultura Sailaren industria-ondare higigarrien biltegia) ezagutzera. “Industria ondarea, sormena eta berrikuntza” izan genuen bisitako hizpide, eta euskal industriaren betiko ezaugarrietako baten berri eduki genuen; hau da, asmatzeko eta birsortzeko ahalmena. Horrela, Konsoni Lantegiko makinak, lanabesak eta piezak gure industrietako sormenaren lukukoak izan ziren. Eskerrik asko bisita horretan parte hartu zenuten guztioi, industria-ondare higigarriarekiko interesagatik! Ainara Martínez Matíak emandako azalpenak aditu zituen CREADIS3-Smart Creative Districts programaren partaideek Zorrotzaurreko Konsoni Lantegian, Eusko Jaurlaritzaren Kultura Sailaren industria-ondare higigarrien biltegian. (Argazkia: IOHLEE). 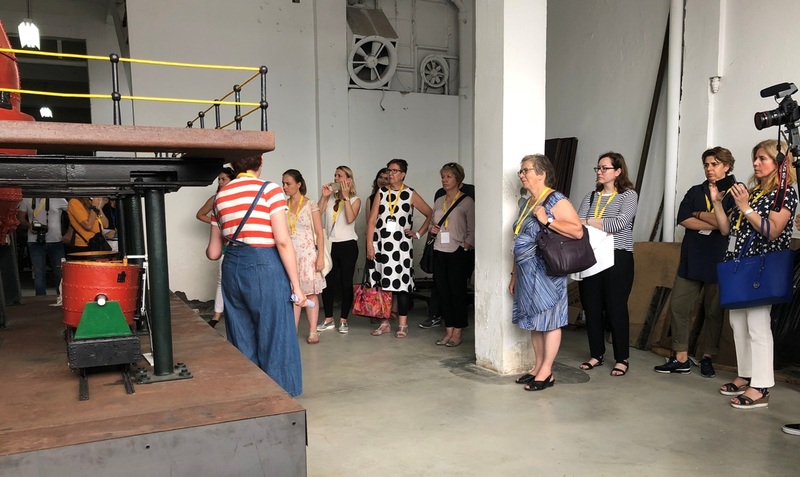 Short after visiting ZAWP, the group enjoyed a guided tour in the old Consonni factory in Zorrotzaurre area, provided by the Basque Association of Industrial Heritage and Public Works, a non-profit civil association, pioneer in Spain in the preservation and promotion of the reuse of old industrial spaces. 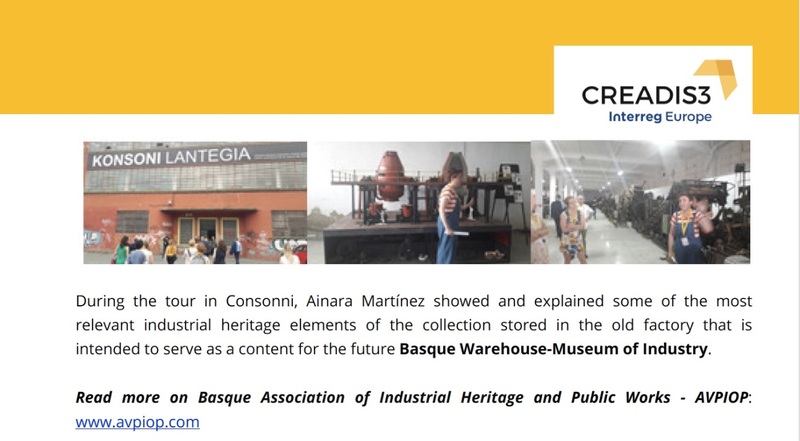 During the tour in Consonni, Ainara Martínez showed and explained some of the most relevant industrial heritage elements of the collection stored in the old factory that is intended to serve as a content for the future Basque Warehouse-Museum of Industry.